Think systems, not goals. For a long time I would struggle changing my habits because I would think “I want to get in shape,” but if “getting in shape” is your goal, then your system must involve exercising, changing your diet, and avoiding situations and places where you’re bound to eat things you don’t want to eat. The reason you don’t get the change you’ve been striving for is not because your goals are wrong: its because you have the wrong system in place. Bad habits repeat themselves because the wrong system is in place. “You do not rise to the level of your goals, you fall to the level of your systems,” Clear writes. Winners and losers have the exact same goals, and you should be far more concerned with your current trajectory than with your current results. Bad habits are often the result of environments conducive to them. I had a bad habit of not taking my medicine in the morning that I need to take. So, listening to James Clear’s advice, I added a “cue” to help me remember to do it: I put my medicine bottle right next to the bathroom sink, and alongside a water bottle. Now, every morning while I’m brushing my teeth, I see the bottle and take my medicine. It was adding a simple cue to my environment that helps me to remember. Clear recommends looking at your entire environment in terms of relationships. I noticed that the bathroom sink was where I spent 2-3 minutes brushing my teeth, and where I would most likely see the medicine bottle. It could be something as simple as laying out your gym clothes, shoes, etc., the night before, so that when you wake up, everything about your environment is already conducive to you going to the gym. The four rules of Habit forming: make it obvious, make it attractive, make it easy, make it satisfying. To make something obvious, it has to be something you see every time, like my medicine bottle in an obvious place. Having a habit tracker also clearly tells you what you’re doing and what you’re not doing each day. Making a habit attractive involves pair habits you NEED to do with habits you WANT to do. Our brains are constantly in a stimulation-reward loop, and so if we can design ways of ‘rewarding’ our brains in connection with needed lifestyle changes, habits will form. Similarly, joining a culture where the habit you want to do is accepted and celebrated (like Crossfit for exercising) makes it attractive. To make a habit easy, reduce the friction surrounding the good habits, priming your environments so that the good habits will more likely than not happen. Increase the friction surrounding bad habits. The example given is unplugging your TV after each use. If you know you have to get up off the couch to plug in the TV, you will more likely than not watch less TV. Finally, making a habit satisfying means giving yourself immediate rewards after you do a habit, use a habit-tracker to “not break the chain,” making a game out of it, and never miss twice. None of us will be perfect, and we’re going to mess up, but focus on getting right back on track after breaking a chain. Habits can change your life, but only the Gospel can change your heart. Now, I’m not much of a ‘self-help’ guy, and I would be remiss as a pastor if I did not bring a snippet of biblical wisdom to the ‘habits’ conversation. While you can make a lot of changes to your life through diligence, discipline, and practical wisdom, no amount of effort can change the heart. Only the grace of God can do that, given to us in Jesus who laid down his life for us, conferring upon us a brand new identity to those who trust in him. That new identity can be one of the most powerful motivators for putting off the old way of life, and putting on a new way of life characterized by love, joy, peace, and self-control. But in the meantime, thank you James Clear for giving us some wisdom on our brains and our behavior. Powerful read. Three Lessons of Loss from the Chiefs Kingdom. What a season for the Chiefs. Last Sunday, our church was filled with a Sea of Red at all of our campuses as we paused to remember that we are a part of a Kingdom much bigger than the Chiefs kingdom, but few of us could take our minds off the AFC Championship kickoff coming in a few hours. We all huddled in our living rooms, away from the 17* weather outside, heated up our nachos and snack food, fired up our TVs to root on the boys in RED, and watched a frustrating loss against the Patriots. 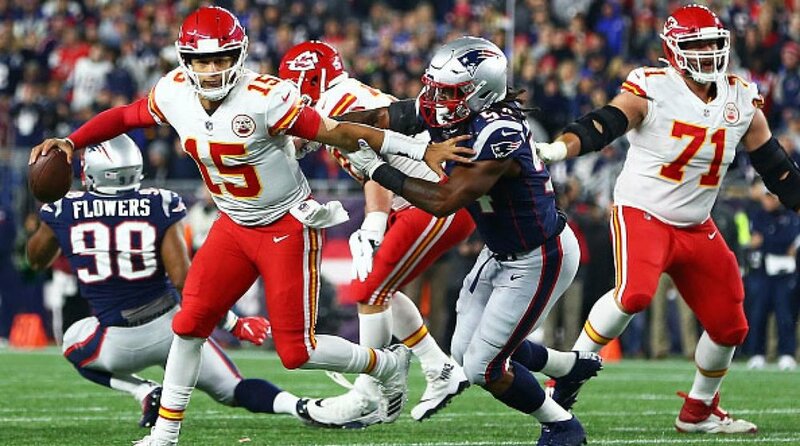 Because the game is what everyone was talking about, and because I’ve developed a fondness for all things local, I want to offer three reflections on the fall of the Chiefs Kingdom in the AFC Championship. Patrick Mahomes: Learn from the greatness of others, but don’t be afraid to be yourself. Left handed shot-put style throws, no-look across-the-defense passes, side-handed tosses that seem to curve around defensive players and into the hands of his receivers, there has yet to be a game where Pat Mahomes did not do something that caused us to go “wow.” Throughout the game I kept wondering what it must have been like to be Pat at 23 years old, competing against Tom Brady at 41 years old. Brady was probably one of his NFL heroes growing up. Pat sought to emulate Brady’s uncanny ability to move around in the pocket from watching film of Brady back in college (thanks Ben Field for this insight!). Now he makes his fair share of mistakes, and Tom Brady may be the NFL’s GOAT, but the kid is a class act in front of the media, and all around fun to watch. Now Tom may have had more yards than Pat Mahomes, but Pat is beating Tom in every category (with slight exceptions in Yards per Game and Completion percentage), and has not been afraid to do things that even Tom Brady would never do (like a no-look pass). It seems a good rule of thumb to watch the top performers in any given field, and seek to be like them and surpass them, but to never be afraid to bring your own gifts and abilities to whatever field on which you play. Dee Ford: Sweat the small things. Towards the end of the game, Tom Brady’s pass was barely missed by Rob Gronkowski and intercepted by the Chiefs in what appeared to be a certain touchdown, only to be called back on an encroachment call on Chiefs outside linebacker Dee Ford. People were saying that Ford had lost the game for the Chiefs. A video emerged in which Dee Ford was asking teammates on the sideline whether or not he was really offsides. You cannot help but feel sorry for him. As angry as we get at players representing the teams we cheer for, let’s remember that they’re human. Another video emerged of Dee Ford, reportedly hours after the game, was on a flight sitting next to an elderly woman carrying on a very polite conversation. It is helpful to remind ourself that these guys are young, they’re human, and they make mistakes. The other side of it is that you can’t make those kind of mistakes at this level of competition. When you’re competing for the AFC Championship, you need to sweat the small things. How many thousands of times had the defensive team went through practicing lining up on the line of scrimmage and avoiding those kinds of penalties? It is popular to say ‘don’t sweat the small things,’ which is true enough when talking about anxiety and worry, but when it comes to being excellent in everything we do, Dee Ford’s small mistake is a reminder that we should sweat the small things. Tom Brady: Never miss twice. I’m reading a book called Atomic Habits by James Clear (highly recommended) and there’s a huge piece of advice he gives to people trying to form a new habit in their lives: “never miss twice.” Basically he says that as you get momentum with your new habit, you are going to screw up. We’re all human; none of us are perfect. Perfection should never be the goal. Instead, just make it your goal to never miss twice. In overtime, Tom Brady converted three third-and-ten situations to first downs. Basically the Chiefs defense missed three opportunities to stop the Patriots drive. Missing one is bad enough, but you still have a chance to get lucky. Few teams though can miss three third down conversion opportunities, especially in a championship game in overtime and still expect to have a favorable outcome. Also, Brady dodged a bullet with his mistaken pass that was intercepted and called back because of the offsides call on Ford. But he didn’t miss twice. If you’ve found yourself already breaking some of the New Years Resolutions that you made for 2019, get focused, and get back on track. Don’t miss twice. Focus on getting 1% better each day, and after 100 days, you’ll be 100% better. Hats off to the Chiefs for an awesome season. It’s fun being a part of the Chiefs Kingdom. Why No One Names Their Kids "Herod." We’re more similar to King Herod than we think. While entirely understandable why “Herod” is not written on any birth certifications, it is a little peculiar, because I think if we’re honest, the character in the Christmas story that many of us most resemble is Herod. Sure, we’re not out there killing babies or murdering members of our own families out of paranoia, but there is something in all of us that will stop at nothing to get rid of those who threaten our power. Herod’s lust for political power and anxiety over his throne is not so unfamiliar to us. There is something deep within the human soul that rises up whenever anyone threatens our self-centered lives and cries out “No one tells me what to do.” In the book of Romans, Paul reminds us that “the mind set on the flesh is hostile to God, for it does not submit to God’s law; indeed it cannot.” There is something in us that will protect our own thrones at all costs, even when it means getting rid of Jesus. Herod missed out on one of the greatest opportunities in history. Herod had the opportunity to see the birth of Jesus. I recently was reading something Max Lucado wrote about how God did everything necessary to get Herod’s attention. He sent wise men from the east, and words from the prophets. He provided wonders in the skies, and revelation from Israel’s Scriptures. Still, Herod chose to protect his own precarious rule, which would be over in a short amount of time. There are many people who have willingly rejected the voice of God in their lives, not because there are any rational reasons to do so, but rather because to admit belief in God or any higher power comes along with demands on that person’s life. Many who remain in doubt have failed to recognize that they have a vested interested in God NOT existing, for if He does exist, that means they owe him everything, and will be removed from the throne of their own lives. Doubt your doubts! It is far better to give up your throne willingly than to be forced off it. Herod chose pride over humility. “Pride goes before destruction,” the author of Proverbs writes, “and a haughty spirit before a fall.” Fall Herod did, just like every king before him, every other ruler in history, whether Pharaoh, or Nebuchadnezzar, or Alexander the Great. We don’t get to keep our thrones. The positions of leadership in which we find ourselves are always temporary so we should approach them with an open hand and with humility. The way of Jesus is marked not by self-preservation, but by self-denial. Herod’s pride destroyed his family, destroyed the town of Bethlehem, fragmented his kingdom, and destroyed his legacy, because he could not release control of his kingdom to another king, even if it was just a baby. Proud people miss out on the voice of God. Pride will always eventually take you to some great plummet; humility and wonder will lead you to the manger. Even though we all have a ‘little king Herod’ inside all of us, may we be careful that we do not miss the manger. May we be aware of our subtle attempts to get rid of Jesus (even as we pretend to be Christians and use a lot of religious language to cover up the real issues of the heart). May we choose humility over pride. And if you ever do meet anyone named ‘Herod,’ don’t chide them for it, but maybe see if you can subtly get the nickname “Harry” to stick. 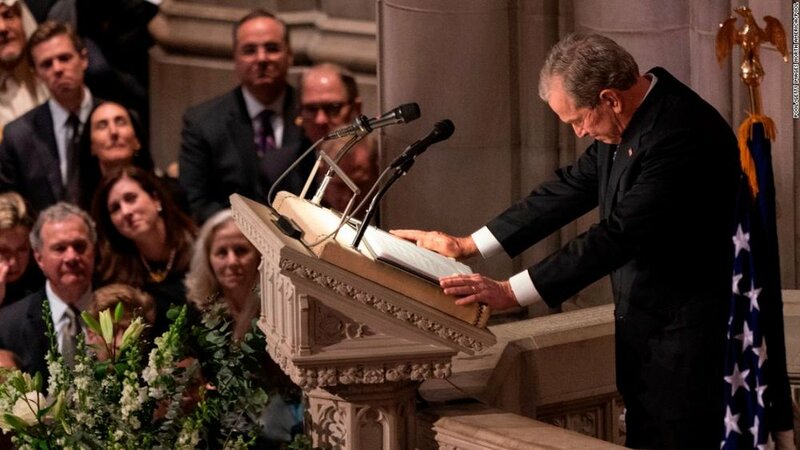 Four Lessons from George W. Bush's Eulogy. Last week George H. W. Bush passed away. I don’t remember much of his presidency but I do remember seeing tanks driving across the desert on TV during the Gulf War (I was in first grade), along with seeing a press conference with the president announcing his opposition to the Iraqi invasion of Kuwait. Dad taught us how to die well. W said of his father: “As he aged he taught us how to grow with dignity, humor and kindness. When the good lord finally called, how to meet him with courage and with the joy of the promise of what lies ahead.” I was reminded of Psalms 90:12, which says “teach us to number our days, that we may gain a heart of wisdom.” I think part of being a good father is to teach your kids that life is short and we must live it to the fullest, that every day is a gift, and that our future is not guaranteed. Just as GWB remembered his father parachuting at age 90, or racing his boat across the Atlantic Ocean, will we be remembered for our passionate engagement with life? Or will we reach the end of our days full of regrets? Dad was humble. "When he lost, he shouldered the blame,” remembered GWB. “He loved to laugh, especially at himself.” He quoted the former president’s inaugural address, in which GHWB said “what do we want the men and women who work with us to say? That we were more driven to succeed than anyone around us or that we stopped to ask if a sick child had gotten better and stayed a moment there to trade a word of friendship.” Paul wrote to the Philippian church “each of you should look not only to your own interests, but also to the interests of others. Have this mind in you that was also in Christ Jesus, who being in the very nature God, did not consider equality with God something to be grasped at.” If I am remembered for anything when I die, I want it to be that I was humble. Not in the shallow understanding of humility that usually means being a pushover, but a humility that expresses itself in fully attentive presence with those around me, and accepting my faults and failures with self-grace. Dad was generous. “He taught us that serving others enriched the giver’s soul.” George W. Bush remembers his father as being a servant of other people. He had an enormous capacity for caring and listening to other people, W recalls. There is no greater example a parent can set for their children than the example of generosity. I love generous people, and am striving to do everything I can continue to grow in generosity to others. The Bible says “whoever sows sparingly will also reap sparingly, and whoever sows bountifully will also reap bountifully. Each one must give as he has decided in his heart, not reluctantly or under compulsion, for God loves a cheerful giver.” Cheerful givers spread cheer, and what a legacy to be remembered by, that you were generous to all! Regardless of which side of the political aisle you are on, I think we would all do well to be remembered by our children for such things. #AmIRight? Four Reflections on John Chau's Death. Two weeks ago, 27-year-old missionary John Chau was shot with arrows by the isolated Sentinalise people on North Sentanalise Island, a remote island in the Bay of Bengal. Somehow his death created a media firestorm from both Christian sources and non-Christian sources that criticized Chau for a lack of preparation and inappropriate contact with a people group untouched by modern civilization. Others wrongly used his story to attack Christian colonialism and cultural obliteration by Western missionaries throughout history. The early news sources were short-sighted, however, and days later reports emerged that he had trained for years for this mission, including linguistic, EMT training, and sports medicine training, all of which would be helpful training for such an endeavor. First, remember that Christianity has always been a missionary faith. Ever since Jesus gave the command to “go into all the world and preach the Gospel to all creation,” (Mark 16:15) and to “make disciples of all nations” (Matthew 28:18) Christianity has been on the move. While the ‘missionary’ nature of the Jesus movement has been hijacked throughout history for other political purposes, the command to “go” remains inescapably fundamental to the teaching of Jesus. If a person truly claims to believe that Jesus is who he said he is, that he is the “way, the truth, and the life,” that “no one comes to the Father except through me,” (John 14:10) and that “salvation is found in no one else for there is no other name under heaven given to mankind by which we must be saved” (Acts 4:12) … if you really believe these central teachings of the New Testament, you must live on mission to others. A pluralistic world will always reject the missionary nature of Christianity. The claim of Christianity that Jesus is the only way to God has sent its Church on mission for the last 2000 years. This claim has been labeled as too narrow or too exclusive. Such critics fail to recognize that to claim one religion is right and all the others are wrong is no more narrow than to claim that one way of thinking about religion (namely, that all religions are the same) is equally as narrow and exclusive a claim. If you knew you had the cure for cancer, and the entire world did not believe you, would that stop you from trying to convince them? Christianity teaches that there is only one cure to the deep problems of the human soul, so someone who considers themselves a follower of Jesus but is not living on mission has not truly understood the heart of the Christian faith. At the same time, John Chau could have been wiser in his approach. As I write that last sentence, I immediately feel guilty. Here I am sitting behind a computer screen typing while he laid down his life for what I say I believe. At the same time, we ought to be careful to make sure that our motives are to advance God’s Kingdom, not simply to seek thrills and adventure. Jesus instructed his disciples to go out into the villages two-by-two. Apparently there were several people that offered to go with Chau, but he chose to go alone. In addition to this, Jesus said to those he was sending out: “Go you way; behold, I am sending you out as lambs in the midst of wolves…whatever house you enter, first say ‘Peace to this house,’ and if a son of peace is there, your peace will rest on him, but if not it will return to you” (Luke 10:3-5). John Chau illegally asked fishermen to take him back to the island even after having arrows shot at him, including one that hit his Bible. When you ought to ‘shake the dust off your feet’ and move on seems to be a matter of personal discretion and wisdom, but the fact that several of the fishermen who took him to the island have since been arrested seems to indicate there may have been a wiser approach. I’m thankful for modern examples of young people with a heart to risk everything for the gospel. I’m thankful for the witness of people like John Chau. He mentioned in his journal that one of his biggest influences was the missionary David Livingstone, who once said this: “God, send me anywhere, only go with me. Lay any burden on me, only sustain me. And sever any tie in my heart except the tie that binds my heart to Yours.” May all of we who claim Christianity possess such a reckless abandon to our own lives if only the world might come to know Jesus Christ. The last entry in Chau’s journal read: “You guys might think I’m crazy in all this but I think it’s worthwhile to declare Jesus to these people.” Even friends of his said that he “kind of lost his mind a bit.” It is evidence of the cultural accommodation of the American Church that behaviors that we now look at as “crazy” were normative in the New Testament. Jesus promised his disciples that “in this world you will have trouble,” and that “a servant is not above his master.” The way of Jesus will always end on some sort of cross, and for John Chau it meant laying down his life. It turns out, ‘radical’ in our western sensibilities seems to be “minimum requirements” in the kingdom of God.